DynDNS.org, the awesome service that lets you access your home computers from anywhere, recently announced that it’s getting rid of its free accounts. The most basic account now costs $25 per year. Fortunately, we can use PowerShell to keep our DNS names updated with the latest public IP Address from our Internet Service Provider for FREE. In this article I will update the domain name “test.jppinto.com” with the latest public IP address from my Internet Service Provider. I use Enom.com for my Domain Name services, they charge about the same as GoDaddy and have very useful features for Domain Name management. 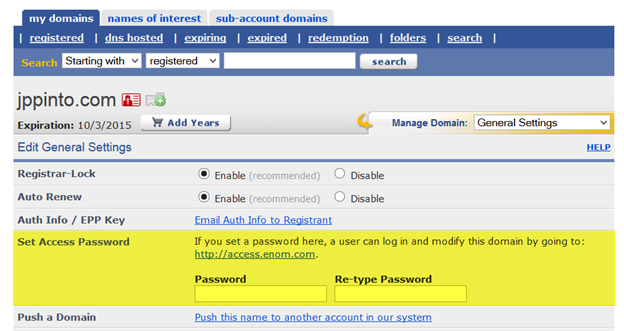 Under “General Setting”, you can set a password to access Domain Name settings. PowerShell Script to Update IP Address for test.jppinto.com. You can use this and schedule to run periodically from a machine where you need the DNS update. This entry was posted on Thursday, September 25th, 2014 at 1:15 am and is filed under PowerShell. You can follow any responses to this entry through the RSS 2.0 feed. You can leave a response, or trackback from your own site.